Many riders enjoy road riding because they can go out their front doors and go explore the world on two wheels. Road bikes are getting lighter, more durable, and more compliant. With the addition of disc brakes to many road bike models, the versatility continues to grow. 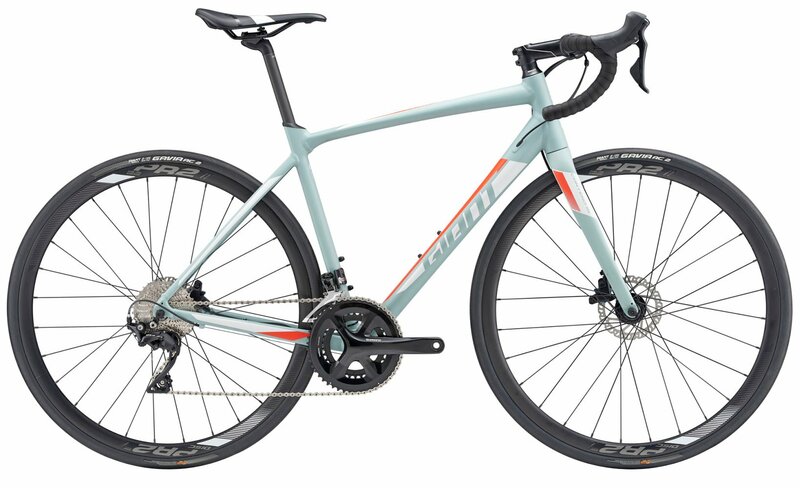 The 2019 Giant Contend SL 1 Disc Bike is an aluminum framed road bike that has disc brakes and tire clearance for up to 28c tires. The frame geometry is built for balance and an all-round feel. The D-Fuse composite seatpost reduces the road vibrations for a smoother ride. The Contend 1 comes with a Shimano 105 2x11 drivetrain that provides smooth and reliable shifting so riders can ride long distances with confidence. There is a wide gear range so riders can climb efficiently and accelerate on the flats. The hydraulic disc brakes provide confidence-inspiring stopping power needed to longer descents. Giant P-R2 disc wheels roll smoothly and efficiently and are paired with Giant Gavia AC 2 Tubeless ready tires. This combination of components means you'll have a bike that can ride long distances and won't be held back when it comes to steeper or rougher terrain. 157 - 167 cm 5'6" - 5'8"
167 - 173 cm 5'8" - 5'10"
173 - 178 cm 5'10" - 6'0"
178 - 183 cm 6'0" - 6'2"
183 - 188 cm 6'2" - 6'4"